Material flipping is one of the best markets for beginner gold makers looking to get better at the pure Auction House based methods. The major advantage is of course that items generally sell quickly, so the margin of error is quite generous and you are very unlikely to lose a lot of gold or make particularly bad decisions. If you don’t know what flipping is, I’ll refer you to my earlier posts on the subject. These were written during Legion, but the basic idea remains the same. I have just started doing some material flipping on my challenge realm and you can see the resale summary for materials below. These are all from the last week! There is a lot of gold to be made if you can find a farmer and buy directly without the AH in between. Large farmers will usually be willing to sell their mats below market if they can be sure you will buy it. Advertise in trade with messages like this: “WTB Monelite Ore, any amount 30g I buy large amounts every day!”. It can be a great competitive advantage both for flipping and crafting. I am only talking about BfA materials here. Herbs and food and fish are the top three because they are primarily used to craft consumables. This is great as it ensures high and very predictably variable demand. Enchanting materials are also used for consumables, but the materials are primarily created by mass crafting so supply is generally too even for flipping on my realm. It could be different for you. Herbs are awesome to flip. Demand is highly variable, and it’s fairly predictable throughout the week. Potion and flask demand peaks on raid reset day. Herb prices will generally fall throughout the week and hit bottom during the weekend. Then go back up slightly around Tuesday/Wednesday. There’s also a lot of gold to be made from turning smaller stacks into stacks of 200. 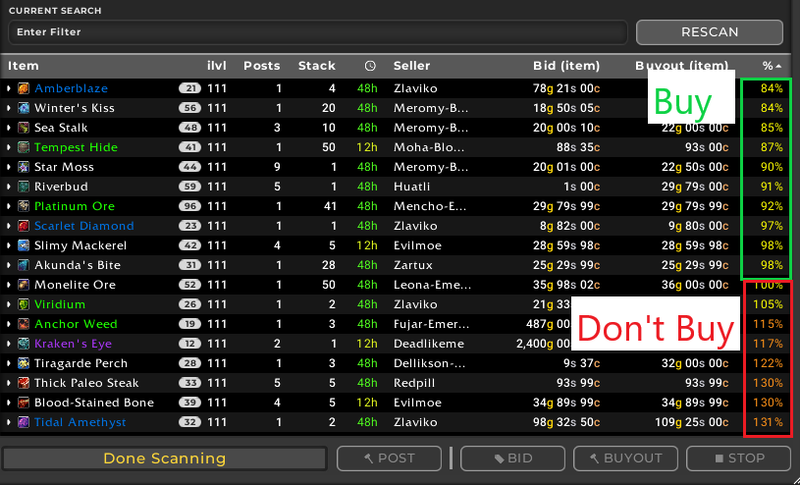 The small stacks are usually cheaper and you can often get away with posting stacks of 200 at 110% dbmarket. Start with the basic herbs and then experiment with Ancor Weed using manual posting, as they are not used in the same amounts. Food and Fish materials are used in cooking recipes. Demand varies between the items based on what recipes they are used in. The food recipes usually take 5 of each so you can usually sell large volumes without problem. So far I’ve found that the various fishes sell best, particularly the ones used in feasts. Meaty Haunches and Stringy Loins will also sell in really large numbers. Pigments are used by Inscription. They are primarily used for Darkmoon Cards, and thus only the viridescent pigments or inks are really interesting. Demand can be uneven, but the market for decks is quite competitive. If you want to enter this I suggest looking for cheap viridescent inks. I would not recommend going into the market for crimsons or ultramarines, at least not with my basic settings. You are completely dependent on getting your pigments substantially below market to make this work. I suggest setting the max price to 70% dbmarket to increase your safety margin. Ore is sold by farmers, both smaller and larger. Monelite ore is used for the various BS consumables as well as for leveling blacksmithing. Storm Silver is primarily used for blacksmithing gear and platinum ore is mostly used for prospecting. . You will want to focus on selling at 100% dbmarket to ensure sales. Make your gold by finding ore that is cheaper than 70% dbmarket to ensure strong profits. The end items are not all consumable so this market is riskier than the ones above (but it can still be great). WARNING: Veiled Crystals are still very volatile and trending downwards. I do not suggest using my setup out of the box for flipping them. Enchanting materials are typically primarily crafted by enchanters shuffling. As these people mass craft the items supply is steady. I would therefore generally suggest being careful flipping Gloom Dust and Umbra Shards. Veiled Crystals are much harder to reliably craft on the other hand so they exhibit higher variability. They are used for all the high-end enchants and demand will spike on Raid reset day so make sure you are selling on Wednesday/Tuesday. Your best bet is to sell to people who use the leather or cloth for the Expulsom shuffle, especially players who craft a lot of Honorable Combatant armor or the Darkmoon Decks. This means you need to buy your items well below market value, as this process is usually very price sensitive. It is also the main driver of leather/cloth prices. I have not yet tried my hand at flipping this market, so I am not sure which items are best. I would assume finding the items used for the shuffles for significantly less than market value to be the best way to make gold in this market. You can find my TSM settings in my pastebin. They are generalized for all Legion materials to buy below 80% dbmarket and sell in stacks of 200, 100, 50, 20 and 10 at 100% dbmarket. The group linked contains all the BfA materials and applies the same settings to all of them. It will only undercut other stacks of the same size. You will typically want to improve it as you go. When you scan the result page will look like the screenshot below. You will typically want to buy items that are below 100% of the max price as indicated in the rightmost column. I realized that my setup and approach above is a bit too focused on the way I flip, so I added this section for beginners. In this case I would say this applies to players below 100k. For you capital will be a limiting factor. This means two things, you want to take on less risk, and you want to sell your stuff even faster to get some quick sales. It means you need to focus on a subset of materials. You should start with just one item at a time. I would suggest picking one of the cooking materials used in feasts or Riverbud/Siren’s Pollen. Do not invest too much gold at a time. Your risk tolerance will have to be the guiding factor here. You should also use a more conservative setup. I would suggest using a maximum shopping price of 60% dbmarket and a minimum price when posting at 80% dbmarket. You can get a TSM group here that only contains the food and herb groups as well as settings with reduced price levels. i’m a noob to all this and i’m having trouble with importing and getting this string to work in tsm4. i’ve made a group, imported the whole string to that group, but when i go on shopping and search, it finds nothing at all? just looked around a bit more, do i just apply a DBMarket operation to it? sorry for the questions! The group should include operations if the import worked correctly. Can you check if the groups contain the right items and that they all have operations attached? I’ve been also having issues importing the group. The groups seem to come in but they are missing the operations. I’m not exactly sure how AH posting fees work these days,… there was a change recently,…but the AH cut of the sale price is 5%. This applies the same for all Actions regardless of whether it was sold by bid or buyout. From what I recall, the pricing is based on a flat “listing fee” and then if the item sells the AH also takes a cut. The change that came forth was the “listing fee”. It is now the same regardless of stack size. So if you list a single item the fee would be 19g, plus the 5% cut. On the other hand if you listed a stack of 200, the fee would still be 19g, plus the 5% cut on a sale. For me I see a pro and con to this. Pro is single item listings for five pages will be reduced, as the profit margin is reduced for trolls. Con is if you only have say five and and you want to dispose of them you will be at a loss. Only way to really profit is stacks of 20+. Although I haven’t seen anything higher than 19g for the mats, which this pricing seems to apply to. Also it is only applying to BfA mats, I have not seen much change in how prior expac mats are priced, although I have not been farming them due to current content so not sure on all the prior mats. Hey! Just wanna say thanks for during all the hard work. Really enjoy following your posts and thoughts about goldmaking :-)! Have a nice weekend. Beginner gold makers should stay away from any form of flipping until they have a sound understanding on how the economy in their servers work. By the time they have that understanding they are no longer beginners. You fail to mention that you need to have a large amount of disposable gold, that you are willing to lose, before you even start considering flipping mats. There is so much fallacy in this post. Its very irresponsible on your part to promote so much misinformation. I disagree that flipping materials is risky. Buying materials below 80% dbmarket is probably the safest pure AH/crafting market you can be in. When crafting items you would be buying your materials at even higher prices which introduces more risk. Even the worst case is really a limited loss if you stick to markets with fast moving items like herbs and food. I also disagree that you need to know the market before you start flipping. I think material flipping is the best way to learn the market actually. Generally speaking you learn more by doing. All that being said I think my post is probably too focused on the way I flip materials, and not focused enough on how you would go about this if you are a newbie. I also disagree with you that material flipping requires a lot of capital, it can be done with as little as 10k, but your strategy would probably be different than my generic setup. I’ll update the post with a more in-depth step by step description for newbies, with a lower maximum price threshold to further reduce the risk, but I think material flipping is the best market to really get into proper gold making. The only thing with less risk iss really farming. Unless you decide to try to control the price of Anchor Weed or something. You are contradicting yourself. On the original post you state that “One very important thing to note is that flipping can be risky”. Now, on your response you state “I disagree that flipping materials is risky”. Flipping items in the AH require the kind of capital that you are ready to lose. Its a gamble and like all other gambles it has an inherent risk associated to it. The markets are too volatile now to advocate that a beginner takes the type of risk that can wipe all of their capital. You can start flipping with a 1000g gold for all I care but only if you are ready to lose that 1000g. The audience for your post is the gobling that has some experience with his market and has enough capital that they can afford to lose it if the markets turn. Your post makes it seem that flipping is a sure thing. “Do this” and “Do that” and you will make gold. Its not a sure thing. You can buy a stack of Sea Stalk to make a bundle of 200 for 29g p/u average only to have someone come and post 13 stacks of 200 for 25g p/u and then have everyone else undercut underneath all the way to 20g p/u. What then? What will you tell the begginer gobling that just put all their gold in to your advise and see the value eroded by the market? Wait? Buy more? Sell at a loss and try again? Bloggers, Youtubers, Twitchers need to be more responsible with he kind of advise they give. At least you acknowledge that your post is “probably” too focused on the way you flip materials. That is a start as you are not a beginner and can afford to take risks beginners cant. When I say “flipping can be risky” in the main post I am talking about flipping in general including markets like battle pets, transmog etc. Some materials are riskier than others, but if you stick to fast moving items (Stringy Loins) for instance you will never have your gold wiped out. Even in your scenario which is close to the worst case for material flipping you would lose 30% of your invested value. As for your example I would definitely tell people to sell at a loss in that case. I think the scenario is incredibly unlikely though, at least if you are actually buying materials when they are cheap relative to dbmarket. Most material prices have remained quite stable over the last two weeks, and outside of enchanting I don’t think there’s too much volatility to flip materials. I also think that you can take as much risk as you want if you are a complete beginner. Obviously the psychological impact of losing 10k is huge if you only have 30k gold, but you can get 10k gold from running cata raids for an hour and just vendoring the drops. What would your recommendation for newbie markets be? Only talking about markets that only rely on trading with the auction house, farming is obviously risk free, but it will never teach you to flip or craft profitably in my opinion. 1. 29g P/u for Sea Stalks is most likely mid 80% -100% Dbmarket. ( I have never bought Sea Stalks for more than 19g P/u. 29g P/u is usually where i sell. 2. The object is minimal effort for maximum reward. If you want fool proof, non-risk gold production. Farming is logistically the only feasible option. 3. You are correct in regards to risk being present in any level of the auction house gambit. However, i think it is pretty well known that, when you buy something with intent to flip, there is no guarantee to return a profit. But as the old adage goes, no risk, no reward. 200 for crafting mats. and resell providing a minimum of 5% profit to cover AH fees. in an irrelevant market in an irrelevant game. Waiting is the biggest tool in our tool belt! In conclusion, one can always learn best by the successes, failures and paths taken by another person. I think these articles are well written, and provide great insight in how to begin an adventure into making gold without hours of tedious farming. So yes flipping can be risky, but you don’t need to be a stock market analyst to identify that. P.S. – Special thanks to TLGM, Your strategies are making me a killing. Awesome work! Glad to have helped you out. 300k profit in a week is no small feat! Im using your settings, but when im posting an auction it doesnt set price at 100% it just undercut people with same stacks, so if i post a stack of 200 it ends up with a price like 115% – how to fix? If you want to force it to post at 100% you can uncheck «match stack size» on the first page of the operation settings. Do they have to be changed? You change the dbmarket og avgbuy? to those numbers? Just replace the entire prices with the three percentages and dbmarket. hej goldmaker. thanks for your tutorials. i did the basic installation and imported your settings from pastebin. but i have a small problem, i guess. when i scan the ah for e.g. “umbra shard”, there is no % shown on the right for flipping, only “—“. some settings not correct?! a hint would be nice. I don’t remember off the top of my head what causes this. Can you upload a screenshot somewhere so I can take a look? I’ve just had this too. If you have the addon but not the desktop app, that is what causes this. I’ve just encountered the same thing. Apparently you either need the desktop app to keep prices up to date, or to do a full scan through TSM to get the percentages to show. Personally I’m opting for the desktop app to keep everything up to date all the time for me. sorry for the long response. i am not able to play that much. any help would be nice. these show the results after a complete scan and i do not have the desktop app installed. Hey, I think the main issue is that you do not have the desktop app installed. This means your price database will not have any prices in it. 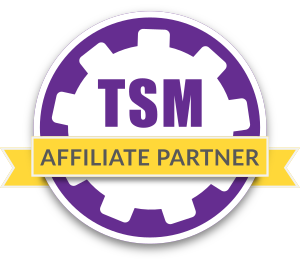 Without it none of the TSM price sources will be available to you. Hiya Lazy Goldmaker, I’m using your strings as a baseline but wanted to get a better idea of what I can do with them. For now I’m flipping ores, herbs and food on the marketplace by buying things beneath 90% of the dbmarket, I want to sell things at above 90% dbmarket and prevent myself from a loss of gold selling stacks of 200, 100, 50 and 20 while ensuring I don’t sell things beneath what I paid for them. Is there any chance you can provide strings that can help me achieve this? My general activity on the Auction House is moving between the shopping tab and buying things beneath 90%, and then going to the auctioning tab to sell those things in pretty stacks for a profit. Thank you so much in advance and for the baseline groups. My setup includes settings out of the box for doing just that, except my max shopping price is 80% dbmarket. If you want to buy up to 90% dbmarket you can just change the included shopping operation to 90% dbmarket. The minimum price of 100% dbmarket should give you a guaranteed profit either way. Everytime I run the shopping operation its giving me wrong lercentages of the item prices. For instance: a herb that is 1g has the 110% market value, where in the tooltip the market value is 1g 50s. How can I fix this? If I scan manually the percentages as correct. It’s working now! Thanks 😀 By the way, what are the advantages of working without using 100% dbmarket as maximum price? The advantage is most obvious when you use the «hide above max price» that filters stuff out. It’s also easier to see the threshold. I’ll buy everything up to my max price typically and 100% has one extra digit which makes the threshold stand out when you show auctions above max. In the beginners string, for platinum ore it says 70%platinum, but no custom source exists with that name. Can you share the custom source? Thanks so much for the guide, as someone with two crafting professions I’ve been absolutely struggling for money on this character, but I also don’t have the time or desire between M+ runs to go farming. I’ve set myself a goal to slowly get into this and flip my way up to a longboi, let’s see if I can make this happen! I have a question on this. So, when I run the post scan and it comes up “Below min price, post as min price” do I still post it? Or does that mean I made a mistake, and the items just won’t sell? This will almost always be the case if you use this settings. We are not trying to be the cheapest on the auction house with these settings, but trying to be at a moderate price, but very nice stack sizes to get sales from players who want to avoid scrolling through endless stacks of 1. I’m starting to understand a little more now. I apologize for all of the questions, I am just very intrigued by your work and want to make sure I understand. So with herbs, for example, is it common for them to take a couple of days of reposting to sell? Or should be selling in just a couple of hours? I’m still in that mindset where if it’s not selling fast, it’s not going to sell. I think once I understand this concept, my morale will go way up. First of all thank you for your guide. I went from a few thousand golds to 134200 g in two freaking days! Amazing. But i have a question for you. To begin with i obviously used your beginner settings but when should i switch to the settings you have? Again thank you for this guide. If you have 134k you cna probably change to my setup, it depends on your realm. If you can still find deals with the beginner setup I would just stick to that tbh. I just started wow and for now i have a limited time to buy token because i plan on continuing to play buy paying with tokens. Still i think it is not enough. To be honest is there i direct advice for a newbie like me to invest some 70k i have to make more? And is flippin transmog good? Some items sell at over 1k and found at 1g-50g but sell rate is low. Should i keep reposting them? My number one suggestion would be to try out some more materials. You could flip herbs and ore in addition to fish for instance. I would not recommend transmog at 70k gold. You need a lot of different items to get consistent sales, as they sell very slowly. It can certainly be possible that my setup doesnt work well on all realms. Keep in mind though that the maximum price for my shopping operation is 80%dbmarket and this is what is used to calculate the percentage. 120% of my max price is about 96% dbmarket. so your max price to buy is still under dbmarket? i think i may have misunderstood the 120% max price point. I’ll try to scan in smaller chunks, i’ve been having a difficult time picking which mats to focus on. Would it be a good idea to start by posting farmed fish my liquid right now is around 20k? I am just trying to get started and have found learning the AH and gold making extremely discouraging as often simple examples like this are giving that i have difficulty replicating any real success. Do i need a simpler starting point? Hey, I took a look at your raw paste bin lines. What do I do with those exactly? Id like to be able to optimize and run tsm with all of your settings if I can. You copy them and add them to tsm through the import UI. It’s in the main window under import/export. Hey! I got a problem with both your groups (beginner and normal one) No operations seems to be added, they all have #default selected in both parent and children groups. Ofc i could override this and select the ones that came with your import but i dont know wich operation to choose to wich group. if i remember correctly operations should be added automatic the way you have exported it but i donno, any tips? That sounds like something went wrong during the import, or you used the outdated import strings. All of my groups should have operations applied. I would suggest trying again on a fresh profile. I have this same issue, did something change in the Add on maybe that is causing? I just tried from a fresh profile and same thing. all the Groups and operations are there but they are not assigned. I’m using your’e settings for a few days now but when i scan the Ah all herbs are above 100% all the time is this normal or im just having bad luck with my realm? Hard to say, it’s often the case for me too with herbs that there are few deals available. You may want to experiment with a thinner profit margin, or just ignore herbs. So im Trying to flip mats. im using your import and im buying below 80% but when i post its below min price for mostly everything . 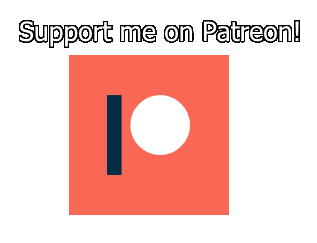 should i post everything at minimum or post it at normal price? That’s how the setup is intended to function. The minimum price is 100%dbmarket and that is almost never the cheapest. By posting in nice stacks you will usually get a nice number of sales anyway. Hi, first of all, thanks for your amazing work, i’m a novice goblin and your post have been super helpful. I have some questions about your TSM setup for flipping. I don’t understand the auctioning operations. You have one for stacks of 5, 10, 20, 50, 100 and 200, so when I do an auctioning scan, it shows results for the same material once for each operation. What am I supposed to do with this? If I just spam post, it will first post stacks of 5, then 10 and so on. Is this how its supposed to work? Or should I prioritise bigger stacks? If that’s the case, is there a way to tell TSM to first try to post 200, then 100, and so on, or should I do it manually? TSM will prioritize the first operation in the list of operations applied to the group. It should prioritize the largest stack sizes as those are meant to be the top ones. I dont use the 5 stack one for materials that sell in volume, and you could make a case for dropping stacks of 10 as well. The point of multiple stack sizes is to have auctions that are desirable for a lot of different players as they will need materials in varying amounts. I see, so I should apply the operations to the group in descending order then. I’ll consider dropping the 5 and 10 stack operations too. Thank you very much! Hva burde jeg gjøre her?